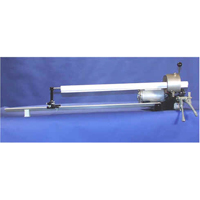 These heavy duty Electric Shade Cutters for schools and other businesses looking to have custom sized Shades for windows and rooms are an all-in-one machine! Custom cut Shades fit well over custom sized windows and pair well with Curtains. The Shade Cutter can measure, pull End Stops and pins, and cut! When you decide to do custom sized Shades by yourself, be sure you are using the right Hardware and Parts for Shades! Take some Uncut Fabric, a Wooden Roller for Shades, and this Shade Cutting Machine and you�ll have custom shades in no time! Our Live Expert Help is eager to help assist you in finding the right shade parts and fabric to use!